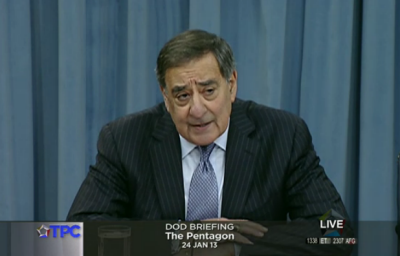 Defense Secretary Leon E. Panetta today announced a lifting of the ban on military women in combat roles. In December 2011, the Pew Research Center examined the roles and attitudes of female military veterans and found that, while many combat roles were withheld from female veterans, women in the military did report experiencing combat and had many of the same issues as men during their transition back into civilian life. Prior to today’s announcement, the Department of Defense prohibited the assignment of women to any “unit below brigade level whose primary mission is direct ground combat,” but while this excluded women from roles like infantry and special operations commandos, many servicewomen in combat-related roles could still find themselves in situations that required combat action. For example, DOD policy changes in the early 1990s allowed women to fly combat aircrafts and serve on combat ships. Why They Serve. For female veterans, the reasons they joined the armed forces are not all that different from their male counterparts. According to the Pew Research survey, 83% of post-9/11 women veterans wanted to serve their country and large shares also saw educational benefits (82%) or the opportunity to build a skill set for the civilian workforce (67%). However, it seems women are more likely to join in tough economic times—42% of post-9/11 female veterans said they joined the military because jobs were scarce, compared with 25% of male veterans. Re-entry. The Pew Research survey finds that women veterans from the post-9/11 era are just as likely as men to experience the struggles and benefits of service upon discharge—fully half say they experience strains in family relations and 42% feel they have suffered from post-traumatic stress. On the other hand, 97% feel proud of their service and 74% say it prepared them for a job or career. Opinions of the Wars. The Pew Research survey also finds that post-9/11 women veterans are more critical than their male counterparts of the wars in Iraq and Afghanistan—fully 63% say the Iraq war was not worth fighting and 54% say Afghanistan has not been worth it (compared with 47% and 39% of male veterans, respectively). Among the general public, by contrast, there are not significant differences in approval for the post-9/11 wars by gender. Growing Presence. From 1973—when the United States military ended conscription and established an all-volunteer force—to 2010, the number of active-duty enlisted women in the enlisted ranks has grown from about 42,000 to 167,000, and women’s share of the military forces have increased seven-fold, from just 2% in 1973 to 14% in 2010. (DOD, Population Representation in the Military Forces, FY2010). Branches and Ranks. Military women are more likely than men to be enlisted in the Air Force (31% vs. 22%) and Navy (25% vs. 22%). Still, a plurality of military women serve in the Army (37%). Among military women, the share who are officers (17%) is slightly higher than the share of officers among men in the military (15%). (DOD, Population Representation in the Military Forces, FY2010). Demographics. The current active-duty female force is more racially diverse than the male force. While 71% of active-duty men are white, only about half of active-duty women (53%) are white. More than three-in-ten (31%) military women are black—almost twice the share of military men who are black (16%). (DOD, Population Representation in the Military Forces, FY2010). These findings are based on a nationally representative Pew Research survey of 1,853 military veterans conducted July 28-Sept. 4, 2011, an analysis of the July 2010 Current Population Survey Veterans Supplement (N=9,739 veterans), and participation trends and other demographics from two Department of Defense publications. Read the original report, Women in the U.S. Military: Growing Share, Distinctive Profile, Dec. 22, 2011. See also our entire series based on the 2011 survey of the military and the public, The Military-Civilian Gap.